It’s the passion; it’s all about passion. You might think that there are thousands of mashgichim; everyone tries, some harder, others a bit less. But, it is not so. What makes a mashgiach great, what separates him from thousands of others who do the same work elsewhere across the world, is that passion. It’s a passion to make sure that all systems are go, every day, that all workers know their jobs and can perform them, and that if there is a problem it’s my problem, not my administrator’s. And, you know what, I’ll do a better job tomorrow. Do you know why? It’s because I know that my real bosses, the ones whom I am really working for are Hashem and you, the kosher consumer. That passion is what we look for when seeking someone worthy of the “Mashgiach of the Year” award, and when we find it, we know that we have a top mashgiach. Then we have the excruciating job to select the one mashgiach who will carry the title as “Mashgiach of the Year”. And, again, we got our man. The 2nd annual “Mashgiach of the Year” award goes to Moshe Stander from Boynton Beach, FL. Moshe Stander works for the “ORB” (the Orthodox Rabbinical Board of Broward and Palm Beach Counties) in southern Florida. His duties include an eight hour a day job at the local Jewish Federation of South Palm Beach County in Boca Raton, FL, where meals are prepared daily for 1,000 by a staff of twenty. With so much activity going on all day at the commissary, anyone else would just plotz down after their shift has ended; not so Moshe Stander. After hours, Moshe does additional work for the “ORB”. It can be kashering at a restaurant, a hotel or a caterer. It can mean running an entire affair. And, sometimes, Moshe Stander is “on loan” to another kashrus agency for an affair where he is needed. Moshe is very dedicated to training the staff at the Jewish Federation. When a new worker comes in, he gets one-on-one training with Moshe who teaches him the basics of kosher. Moshe tries to make the procedures uniform and not complex, making it doable for a blue collar kitchen worker to “keep kosher”. For example, Moshe does not really need to light all the fires, as there are pilot lights on the stoves and the “ORB” relies on pilot lights to avoid bishul akum. At the Federation, however, not all of the pilot lights work. Therefore, Moshe has established an across-the-board policy: he must light all fires, even those which have operative pilot lights. This uniform policy is easier for the workers to comprehend and to follow. If kosher is confusing, there will be problems; if it is understandable, every worker will be able to keep to it. Once trained by Moshe, the new worker goes about his business, but Moshe keeps his eye on him. “I try to become invisible, not to let on that I am watching, until I am finally satisfied that the worker has internalized what I have taught him. That is my way with all of the workers. I watch without them knowing that I am watching them.” Another quote from Moshe’s interview is very telling. “I work with very good people.” Moshe works with the premise that a worker wants to do the right thing. He looks at it this way: “It is my obligation to make it easier for him, to help him do his job properly. I am a facilitator, someone who helps another to do his job properly. I am not a detective, who is out to catch “the criminal”. Instead, I stay out of the way, so that the worker will feel free to act normally. But, ultimately, it is my job to preserve kosher and that is why I am constantly on guard.” Moshe told me of the kosher dinner that he did in Donald Trump’s house and spa, Mar-A-Lago, on Palm Beach. Really! The dinner was for Yeshiva University’s Einstein Medical Center and was attended by the leaders of that institution as well as by another thousand people. Moshe met Mr. Trump, who had come by to look in at the activity taking place in his house. Mr. Trump asked, “What’s going on in my kitchen”? He threatened to eat a non-kosher sandwich right there and then, but he was only kidding. What impressed Moshe was how normal Donald Trump came across to him. This huge affair was going on in his house and he was there kibitzing with the mashgiach in the kitchen. Moshe is someone who has improved the “ORB”. The “ORB” empowers its mashgichim. What do you think is their secret weapon? It is education - kashrus education. Rabbi Pesach Weitz, Kashrus Administrator of the “ORB”, offers his mashgichim plenty of training, when they first start for sure, but whenever “things come up”, he will institute a training session. The mashgichim at the “ORB” to whom I spoke, praised the training given them and were proud to have gone through it. The “ORB” training is always very thorough. The classes are ongoing. You take a two week course under the able control of Rabbi Pesach Weitz when you join as a mashgiach, but there are always regular updates. A problem comes up or an issue is raised and the “ORB” will do a two hour long program, one hour of halacha and then another hour in a caterer’s kitchen doing it practically. After the two week training course, the mashgiach recruit is sent for practical training at a facility. “When I train a new mashgiach,” Moshe related, “he probably doesn’t realize it, but he is under my scrutiny from the moment he arrives, actually, from before he arrives. You see, when a person first starts working and he is coming late or going out for “important” calls, it is a very bad sign and one that I must comment on in my evaluation.” Moshe Stander took it further. After Rabbi Weitz had offered his mashgichim training from a “bug expert” two years ago, two men were selected (one of them was Moshe). Their job became to thoroughly train all the “ORB” mashgichim in proper vegetable inspection. Then Moshe suggested to Rabbi Weitz to offer the program for the housewives and the men in the community. The people were astonished when they saw what was in their veggies. From a career as an airline pilot and then to training pilots, followed by a successful career as a computer consultant, then to become a mashgiach, that is a very interesting path to take. Why did Moshe do it? All I could get Moshe to say is that, “Back in those days, I rarely did a mitzvah at all on any given day. Now, my every day is just one mitzvah after another.” “The ‘ORB’ has standard guidelines for each facility and it is kept in a red binder at that facility. Any mashgaich taking over for another mashgiach can just walk in and know how this facility functions. I don’t know how it can work so smoothly as it does in our facilities. The red binder makes it so much easier to take over for a mashgiach. “There are four things that I want to make your readers aware of and I am afraid that they are going to be new to many of them. 1. “Sometimes, when the caterer goes to an outside event the chef may take along a case of vegetables that requires serious time to check, such as mescaline or parsley. I have seen it a number of times. He will tell the mashgiach that he needs these checked and he needs it done now. In fact, he may have all the vegetable that he needs but he does this to get the mashgiach out of his way. This trick is something everyone should guard against. 2. “The other trick that is quite common is what many a caterer will pull. I can be a tough mashgiach and sometimes when I have worked a job the caterer will tell my administrator to send another mashgiach next time. Whom does he want? Does he want an easier mashgiach, someone who is easier for him to walk all over? “The decision of which mashgiach to send to a job should be left up to the kashrus administrator 100% of the time. He knows which jobs are complicated and which are not. He knows his staff. He should be the only one capable of deciding which mashgiach will do which job. 3. “Another problem that I observe is mashgichim talking one to another about kashrus issues at the facility. That is loshon harah. The other mashgiach can do nothing to correct the situation. Instead speak to your administrator; he can fix the problem. 4. “And, there is one more thing that I want your readers to know. We mashgichim are there working in the trenches and we are working for you. But the very people for whom we are working so hard, almost never even see us. They do not even know that we are there in the facility. Even if you know nothing about kashrus, once in a while ask where is the mashgaich. Walk over to me and ask me how I check this or that vegetable. You’ll be showing me that you care. Maybe even better, you will be showing the caterer or restaurateur that you care, and that is very important. “A mashgiach who does not tell the administrator when he sees something that needs correcting is not doing his job. Yet, if he tells him in a disrespectful manner, then he is equally doing wrong. I work up close to where all the action is taking place. I can see some things better than a rabbi who sits in an office. But he is a rabbi and knows the halacha. I must tell him, but it will be his judgment call. Always.” It was obvious from our interview that Moshe loves his job. But, it was equally obvious that Moshe felt very motivated by the mashgiach training he had received through Rabbi Weitz’s program and the support that he receives from being treated as an important member of the kosher team in Southern Florida. Sponsors of the Mashgiach of the Year Award: Chai Ko Tapas Fusion Steakhouse and Sushi, “RCBC”-certified, is the new fusion Steakhouse in Teaneck, NJ. Your hosts Yamin and Ofira, owners of Estihana. For all your catering needs call 201-530-5665; www.chaikotapas.com. Estihana Restaurant-Brooklyn and Manhattan, an Asian and Sushi restaurant. BROOKLYN—certified by Kehila Kashrus and Vaad Hakashrus of Flatbush. MANHATTAN— Vaad Hakashrus of Flatbush. For all your catering needs call 718-677-1515; www.estihana.com. Paskesz Candy is the leader and innovator in kosher candy and confections. Paskesz buyers shop worldwide and strive to expand its vision for the kosher consumer. More than a candy company, Paskesz has branched out to add high quality grocery items to their repertoire, such as melba toast, corn cakes, rice cakes, and soon to arrive breadsticks. There are always many new and exciting ideas on the drawing board. Paskesz products are all made under the strictest kosher guidelines. "THE GREATEST NOSHES COME FROM PASKESZ". May 14. This program was “open phones”. The questions came fast and furious, What can I have at Starbucks? How about 7-Eleven? And Dunkin Donuts? We discussed toothpaste, mouthwash, the new problem with grapes, and many more topics. The listeners had plenty of questions to ask. May 21. This show was unique. Not only did we depart somewhat from normal kosher issues, but our guest, Dr. Meir Wikler, a Brooklyn psychotherapist, is brother to Rabbi Wikler, Editor of KASHRUS Magazine. The topic was “How Kashrus Plays a Role in Family Dynamics,” parents communicating with their children about family standards, children respectfully presenting a different position and spouses interacting over halacha and kashrus. June 4. Our guest was Rabbi Mordechai Shain and the topic was “The Shabbos Kiddush, Preventing Chilul Shabbos and Kosher Mixups.” We pointed out the need for a mashgiach at even a “simple Kiddush.” June 11. Rabbi Mordechai Shain returned to finish discussing this important topic and make some recommendations to our listeners. On Sunday June 17, KASHRUS sponsored a workshop by Rabbi Mordechai Shain on the halachos of Shabbos that we need to focus on at a kiddush and how a caterer, waiter, and mashgiach can guarantee that Shabbos and kashrus are preserved. This was a two hour program covering a wide variety of halachos and practical advice. It was well attended. June 18. As part of a travel segment, we interviewed two rabbonim, Rabbi Dov Greer, a rabbi in New Haven, CT, and Rabbi Yossie Nemes, of New Orleans, LA who is Rabbinic Coordinator of the Louisiana Kashrut Committee (the “LKC”). Both rabbis talked about their towns, the availability of kosher and other Jewish needs and how a kosher traveler must prepare when traveling to a new community. June 25. Rabbi Reuven Stein, who is the Kashrus Administrator of the Atlanta Kashrus Commission (the “AKC”), was our guest. Gedalya Silverstein, first “Mashgiach of the Year” works for the “AKC”. Aside from life in Atlanta and kosher availability, we discussed the role of the mashgiach and how a vaad works with the national agencies to serve the kosher consumer. July 2. Rabbi Yaakov Lach was our guest. He is the inventor of EZ Filter, head of the Vaad Hakashrus Leinyanei Hamayim and author of the Chulin Illuminated, a man of many talents. We went through the history of the copepod controversy, the different types of filters and which are effective, and why we need them at home, at work, in restaurants, in caterers’ kitchens, and in production plants. Also discussed was which agencies continue to filter their water and Rabbi Lach’s role in the industry. July 9. There was no guest for this program. Our topic was cholov yisroel and cholov stam. We discussed it from both points of view and explained the reasons for each side. July 16. Rabbi Yaakov Lach returned to the program to discuss halachic issues of chickens. What responsibility does the consumer have after purchase to ensure that their chicken is indeed kosher to eat. We discussed how to spot the lung and kidney if they have been left inside the chicken. Rabbi Lach discussed how to determine is a bone was broken before the shechita, before the melicha or afterwards. We discussed bloodshot meat and the concern with it. Rabbi Lach emailed copies of his photos from Chulin Illuminated regarding chickens to all who contacted him. He offered to give a public shiur with actual chickens to demonstrate these problems and how to identify them. Shortly after the show, a Brooklyn organization stepped forward and is planning to arrange that public shiur. July 23, July 30. Rabbi Moishe Dovid Lebovits, Rabbinic Coordinator for the KOF-K and the editor of Halachicly Speaking, joined us in handling a wide a variety of topics including summertime kashrus issues, the problems at certain eateries, his efforts to get individual 7-Eleven stores to certify their Slurpees as kosher, gums, mouthwash and toothpaste. Callers got very involved especially one who operates an ice cream truck. August 6. Rabbi Moshe Vaye from Yerushalayim, the world’s leading expert on insect infestation, joined us. See a synopsis of that interview on page 48 or go to radiohidabroot.com and listen to that program. Rabbi Vaye had arrived from Israel just moments before we went on the air and still he handled all of our questions clearly and thoroughly. We discussed strawberries, grapes, raisins, fish, corn on the cob and a host of other foods. It was a very stimulating show. “cRc” Trains Mashgichim for Chicago Shuls The Chicago Rabbinical Council recently introduced a wonderful program to train shul mashgichim for catered affairs held at Chicago shuls. Until now, Shabbos and kashrus standards varied greatly from shul to shul and many rabbis were unable to benefit from the expertise of the Chicago Rabbinical Council administration which is well-versed in supervising catered affairs. The Chicago Rabbinical Council has now reached out to the individual shuls asking them to send two shul mashgichim to a training program adhering to the particular halachic and practical guidelines of each shul. What makes this program possible is the very unique 83 point checklist that the “cRc” sent out to all shuls. The checklist lists 83 points and the opinion of the “cRc” for each one, leaving a space for the individual rabbi to enter the position of his shul on the issue. This document shows the “cRc” staff just how a rabbi wants his mashgiach to operate and it gives the rabbi a clear document, usable in his shul, for clarification purposes, a “tailor-made” set of Shabbos and kosher guidelines. For copies of the guidelines contact Rabbi Yaakov M. Eisenbach at yeisenbach@crcweb.org or at (773) 465-3900 x 109. First Ever Intensive Vegetable Inspection Training Program for Women Rebitzen Esther Twersky is launching a series of training programs for women in conjunction with KASHRUS Magazine. From the start of KASHRUS Magazine’s vegetable inspection training programs in 2010, women have asked to be included. Finally, we can offer the program to the public. Rebitzen Twersky is highly respected as one who has been trained both in the halachos and in the practical aspects of how to inspect fruits and vegetables for insect infestation. Initially, she is going to offer training sessions to women in the New York/New Jersey area, but eventually she plans to visit other areas as well. All details of these programs will be handled through the offices of KASHRUS Magazine. Interested parties should contact KASHRUS Magazine at (718) 336-8544 or email kashrus@aol.com. Let us know whether you are interested in hosting a program or in attending one. If it is to attend be sure to provide an email address so that we can inform you of all upcoming programs. New Insect Inspection Program Launched, Leading to Mashgiach Position Already in operation is a series of programs hosted in the Flatbush/Boro Park area which is being conducted by Rabbi Dovid Goldstein, who is in charge of the kashrus lab at Pos’tiv. He has conducted all of the vegetable training sessions jointly sponsored by KASHRUS Magazine since the fall of 2010. The program is done in two parts. First Rabbi Goldstein teaches a three hour course in how to find insects in a wide range of fruits and vegetables. This is done in a small group, usually of no more than eight men. Once trained, the participant is expected to go home and practice until he feels confidence in his ability to check produce. Then he has a two hour on-on-one training session with Rabbi Goldstein. If he exhibits the proper proficiency, then Rabbi Goldstein will help him to find a position as a mashgiach. B”H, today many kashrus agencies are looking for mashgichim who are also competent in vegetable inspection and they approach Rabbi Goldstein for recommendations. All details of these programs will be handled through the offices of KASHRUS Magazine. Interested parties should contact KASHRUS Magazine at (718) 336-8544 or email kashrus@aol.com. Let us know whether you are interested in training for personal use or to find a position in the kashrus field. Try to provide us with an email address so that it will be easier for us to inform you of all upcoming programs. 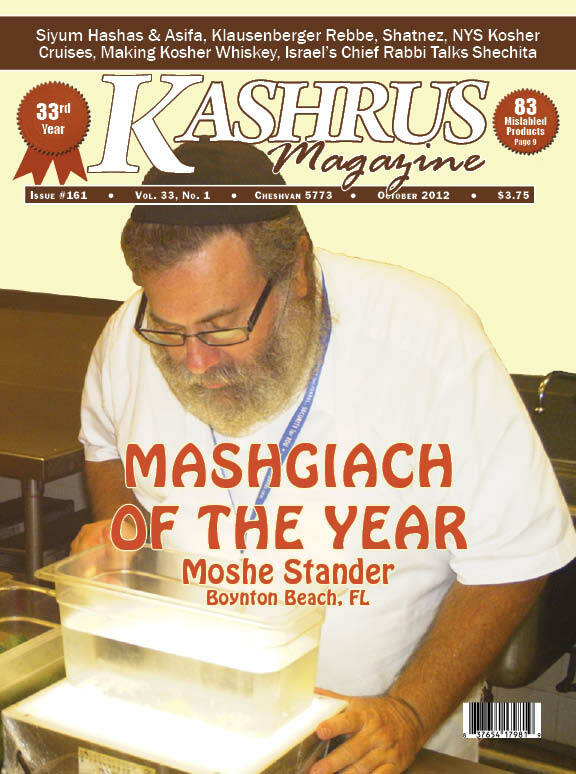 KASHRUS Magazine Shiur on Hilchos Shabbos for Catered Affairs KASHRUS Magazine recently initiated two training programs. After two public programs on “KASHRUS On The Air” (KASHRUS Magazine’s weekly program Mondays from 6-7 Pm on 97.5 FM) regarding the topic of maintaining Shabbos observance at catered Shabbos meals, KASHRUS sponsored a unique halacha shiur for those in the kashrus field. It was attended by a waiter, a caterer, several mashgichim, a rabbinical coordinator of one of the “Big 5” kashrus agencies, and a shochet. That two-hour long session, conducted by Rabbi Mordechai Shain, detailed some 17 common Shabbos issues which come up at kiddushim taking place in various shuls. Often those in charge are caught off-guard. Knowing the halacha and how to safeguard it is crucial for maintaining Shabbos observance at those affairs. Rabbi Shain, a man often called in to be a “special mashgiach” to guarantee the highest standards of kosher and Shabbos observance, presented the problems as they occur, taught the halacha from their sources and made recommendations for avoiding the problems altogether. CDs and MP3s are available from the KASHRUS Magazine office (718-336-8544; kashrus@aol.com). With autumn approaching, many people have begun adjusting their wardrobes for the cooler weather. As KASHRUS Magazine has reported on previous occasions, every season's changing styles and materials bring with new shatnez concerns. As you prepare for the fall season, here are a few points to keep in mind, based on information gleaned from the various shatnez laboratories. 1. Sweaters this season are as popular as ever, and they continue to present shatnez concerns. Many people assume that a simple garment, such as an unlined sweater, should not require checking. The fact is that any sweater which is made of wool or linen should be tested. A sweater's parts are often stitched together by hand (basting stitches) before the final machine assembly. These basting stitches are done using any scrap thread that is available, since they are not noticeable in the finished product. Shatnez labs randomly find linen threads used as basting in wool sweaters. Linen sweaters have a high incidence of shatnez. The seams of these sweaters are often reinforced with yarns of other materials, including wool. These added yarns are well camouflaged, usually being the exact same color as the sweater. 2. Men’s suits almost always require checking. In the past, suits that were made entirely of synthetics (such as polyester/viscose) or cotton were considered free of shatnez concerns. But, in recent years, the labs have found repeated incidents of suits which contained shatnez, even though the shell fabric had no wool or linen. In these cases, both wool and linen were found in the internal components, such as shoulder and chest canvases (stiffeners) and dart (taper) reinforcements. KASHRUS Magazine has written in the past about the need to check custom-made suits, but it needs to be stressed again that one may not rely on the assurances of a gentile tailor or salesperson. The labs continue to find shatnez in custom made garments despite the promises of the store or tailor that they never use linen. Likewise, shatnez removals done by tailors are often done incorrectly. Any removal work done by a tailor should be inspected by a shatnez lab. After the lab certifies the garment as shatnez free the tailor may then complete any necessary restoration work. As the weather turns even colder, winter jackets and coats present their own shatnez concerns. In continuing the trend of recent years, we can expect manufacturers to increasingly use recycled materials in winter garments. These materials usually require special testing due to the mix of various threads and fibers which they contain. Trimmings and other decorative features on coats can also create shatnez problems. Piping (covered cords) are often used as trimmings on pockets and along edges of ladies coats. Laboratories on occasion find shatnez in the inner cord of these piping. Scrap materials also create shatnez concerns in coats. These scraps may be found both inside the body of the coat as well as in the hood. The above updates are meant only as a general guide. In some cases clothing should be brought for testing regardless of the type of garment or materials listed. These cases include garments with intricate fabrics (tweeds, multi-color, or textured fabrics); items with unusual or elaborate embroidery or appliqué; and any garment that you suspect is mislabeled. For more detailed information and questions regarding specific items please contact your local shatnez laboratories. You can find a shatnez lab by calling 1-800-SHATNES or by e-mailing to Shatnezhedqtrs @yeshivanet.com.